This 1913 90-Bore Bat-JAP offers staggering performance, but that’s not surprising considering its pedigree. With the Bat in action, it’s actually possible to see the belt moving with the engine pulses. Stephan Friedl sets the needle valve of the drip feed on the Best and Lloyd oil pump to number two. Then he releases the clip that holds the plunger down, and as the internal spring pushes the plunger up it forces golden globules of lubricant into the sight glass on the side of the petrol tank. You can count the drops: about one every eight seconds. From here, the oil dribbles into a nickel-plated pipe that feeds to the back of the front cylinder. Lubricant will be splashed around inside the crankcase to feed the big end, main bearings, bores and small end bushes. It really is that basic. Now he sets the ignition timing of the 50º Bosch magneto by adjusting the long lever fixed to the left side of the tank. He presses down the thimble-sized tickler on top of the AMAC carburettor until petrol just oozes out, and pulls the engine back on compression. 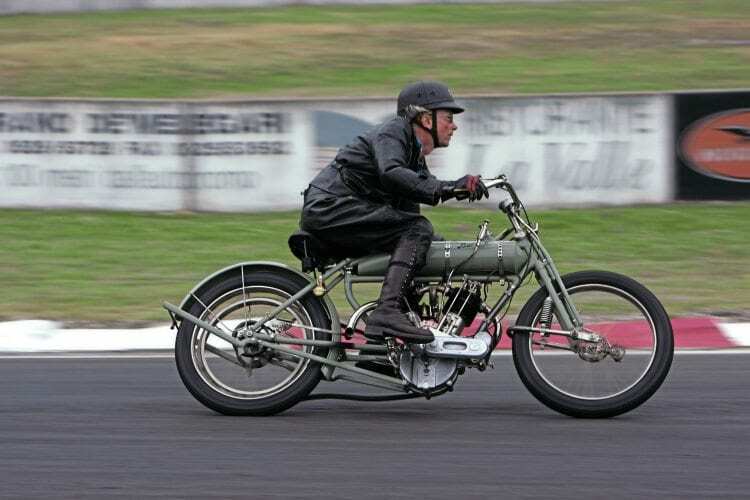 With the lever on the left handlebar pulled in to lift the exhaust valves off their seats, he pushes off and jumps into a side-saddle position as he lets go of the valve lifter.